Blog Topic: "Aging at Home" -- This blog provides information to help fiercely independent seniors to stay in their homes as long as they want. The national movement is called "Aging in Place." I was a founding member of the Board of Directors for At Home In Darien. Your Emotions Can Keep You Well! Many of us believe that our emotions can make us weak. But did you know that you can use your emotions to give you power over stress, and in the process, improve your health? This surprising news was unveiled by former U.S. Surgeon General Vivek Murthy at a symposium in Philadelphia sponsored by Leonard Davis Institute of Health Economics at the University of Pennsylvania. “This is what science tells us,” Dr. Murthy said in an interview with Patti Williams, a professor of marketing at the Wharton School. Positive emotions enable us to perform better and makes us resilient. Chronic stress, on the other hand, is a form of pain that can harm us physically and lead to illness. When felt over long periods, stress creates high levels of cortisol in the bloodstream, which can increase the risk of heart attacks, cancer, Alzheimer’s, and other illnesses. Murthy said that as a nation we need to work on reducing chronic stress so that we can raise the level of wellness. 2. Feeling socially connected: building social ties in your community. Murthy noted that we all need to work on social connectedness because loneliness is becoming an epidemic in our country. Since the 1980s, the percentage of people who say they are lonely has doubled from 20 percent to 40 percent. In fact, an article in the Washington Post said that the feeling of isolation has become a worse health hazard than smoking or obesity, putting lonely people at greater risk for illness. Psychologist Steve Cole and his colleagues at the UCLA School of Medicine, along with collaborators at the University of California at Davis and the University of Chicago, have been conducting research to learn why. They’ve discovered that social isolation changes our health at the cellular level, increasing the activity of genes responsible for inflammation, while dampening the activity of genes that produce antibodies to fight infection. We’re fortunate in Darien to have many organizations that provide easy and fun ways to meet people and socialize. A quick look at the At Home In Darien monthly newsletter shows dozens of group activities – from walking at Selleck’s Wood to lectures about World War II at the Mather Community Center. 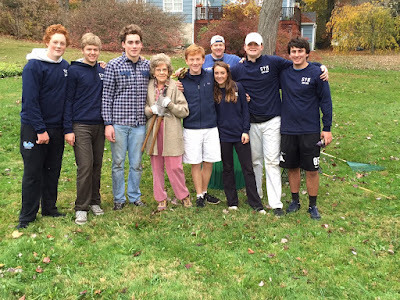 The Darien Community Association also offers interest groups and luncheons, as well as providing a home for the Darien Men’s Association with its own weekly lectures and other special interest activities. Houses of worship, nonprofits, and the local YMCA and YWCA provide countless ways to join a community, attend activities, do volunteer work, and get exercise in social settings. If you cannot drive, At Home In Darien can provide transportation to any local activity or event in our town car or accessible minivan. Volunteer drivers are also available after-hours. For people who cannot go out, At Home In Darien offers other ways to be socially connected: Friendly Visitors, Friendly Shoppers, and a just-launched Friendly Caller program, in which volunteer callers are matched with seniors who would like to receive regular phone calls. To learn how you can get involved with the Friendly Caller Program or to find out about other community programs, call At Home In Darien at (203) 655-2227 or visit the website at: www.AtHomeInDarien.org. Here is the official word about Aging in Place+Gallivant changing to At Home in Darien. Members of the Board of Directors, Maureen Tyrrell, Gina Blum, Erin Shea, Peter Eder, Bill Ball, Kaye Barker, Anne McGuire, Amy Squyres, Nancy Herling and Diana Kalman, display the new and previous logo designs. To more clearly communicate its mission of helping Darien Seniors live independently, comfortably and with dignity in their own homes, Aging in Place+Gallivant (a non-profit, 501(c)3 organization) has renamed itself, At Home in Darien. “Formed almost three years ago by the creation of Aging in Place in Darien and a subsequent merger with Gallivant (the senior transportation service established more than twenty years ago), At Home in Darien is a more reflective identifier of our purpose and programs,” notes Nancy Herling, Board President. A new graphic identity is simultaneously being introduced, thanks to 341 Studios, a Darien marketing and design firm. Gretchen Bruno, Managing Partner notes, “Through simple, comprehensive graphics, At Home in Darien programs will be more quickly recognized and easily remembered.” A set of symbols depicts the array of services and the tag line “connecting seniors to community” has been incorporated into the design. There are almost two hundred aging in place organizations around the U.S. who have similar missions. Darien has been in the forefront of this national initiative, focused on communities. Every Darien resident sixty and over is automatically a member of At Home in Darien. The organization also strives to assist families as they handle the needs of aging parents. At Home in Darien offers flexible transportation alternatives through its long established car and van service. It maintains an expanding database of pre-screened, vetted services providers. Volunteers serve as friendly visitors, shoppers, drivers, and provide basic in-and-around the house assistance with chores. By working with existing public and private institutions like Darien Human Services, the Darien Senior Activities Center, The Darien Community Association, the Darien Library, the Community Fund of Darien, and with regional, state, and national organizations, At Home in Darien provides access to, and enhances programs and services supporting seniors wanting to remain in their homes. “Our programs and services are communicated by our Out and About newsletter, which is mailed three times yearly to all Darien mailboxes and our monthly on-line bulletins”, comments Gina Blum, the Executive Director. Aging in Place+Gallivant has changed its name to At Home in Darien. The organization's board (of which I'm a founding member) made the change to more clearly communicate the nonprofit's mission of "Helping Darien Seniors live independently, comfortably and with dignity in their own homes." Along with the name change, At Home in Darien has updated its logo. 341 Studios did the design. You can learn more at: www.athomeindarien.org. Board Vice President Peter Eder, Executive Director Gina Blum, and Office Coordinator Sandi Kornblum display the previous and new logo designs. I just got the following scam alert from my state senator, Bob Duff. I've received the phone message (a robocall) that Connecticut State Senator Duff cites in his alert. It sounds real, but it certainly designed to prey upon seniors. Last week, I sent out a notice to the media about a call I received at my home regarding getting a free medical alert system. The person who left a message sounded very professional, calm and certain. It was nothing more than a scam. Turns out, many people from all over the country have received the same call - some multiple times. I received a lot of feedback, so I want to make sure you are aware too. Many times the calls come from out of state or another country, which makes prosecution difficult. Only by staying vigilant and passing along information to our loved will be outsmart these criminals. P.S. With these scammers, I've found that it's not a good idea to press numbers to be taken off their lists. It just alerts them that it is a "working" number. Hang up or use your call i.d. and don't even answer the phone. Last week, health columnist Jane Brody wrote an excellent piece on successful aging in one's own home and community. 80 to 90% of American seniors want to remain in their homes. But they can't do it alone. It takes community support. Fortunately, organizations have sprung up all over the country that provide exactly this kind of support. Read the article, "Staying Independent in Old Age, With a Little Help." 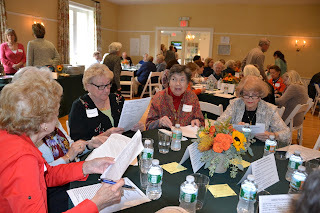 Full disclosure: I am a founding member and a current board member of Aging in Place+Gallivant, an organization that provides precisely the kind of help Jane Brody writes about, but for older adults in Darien, Connecticut. We provide transportation, handyman services, referrals and information. how to talk to someone who has had a loss. Advice for friends of the grief-stricken. Should You Get a P.S.A. Test? why don't seniors ask for help?